Following the successful Allied landing on June 6th, 1944, the combined forces of Britain, Canada and the United States pushed inland. 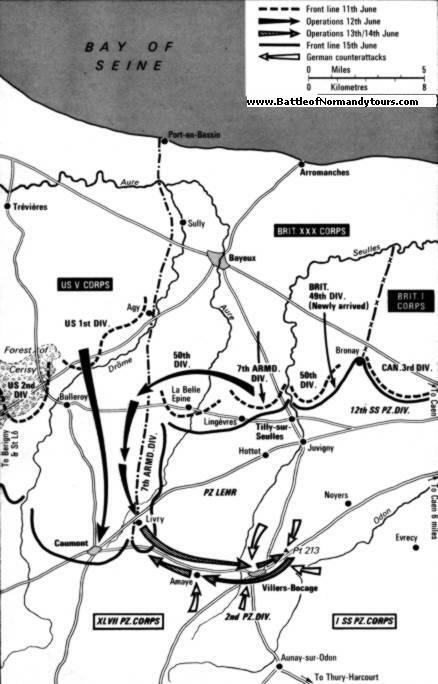 The key to any advance from the beaches was the control of the road network, and the two key towns to Normandy were Caen in the east and St Lo in the west. St Lo was 25 miles (40km) south of Omaha Beach and was not due to be captured until several days after D-day, but Caen in the east was only 9 miles south of Sword Beach. It was close enough to be named a key D-Day target by General Montgommery and was by far the more important of the two towns for the Allies to capture. However, the nearest the Allies got to an early capture of the town was on June 7th, but this advance by the Canadians was halted by the 12th SS Panzer Division (see Juno Beach) and 5 days later the Anglo/Canadian forces were no closer. Although the Anglo/Canadian Forces were held up in the east by strong German Armoured Divisions, the German defense in western Normandy was more chaotic and the main German unit holding the line in this area was the 352nd Infantry Division. Although the 352nd had been a strong, battle-hardened Division on June 6th when they had gone into action opposing the landings on both Omaha and Gold beaches, the Division had recieved no reinforcements since then and had taken horrendous casualties. Weakened by it's constant combat and facing the veteran US 1st Infantry Division, early on June 12th the German line broke about half-way between the towns of Caen and St Lo. This was where the right flank of the 352nd Infantry Division in the west was joined to the left flank of the Panzer Lehr Division in the east. As the German Infantry of the 352nd fell back to the south, the Panzer Lehr held their positions but were unable to help being fully occupied in battle with the British 50th Infantry Division. 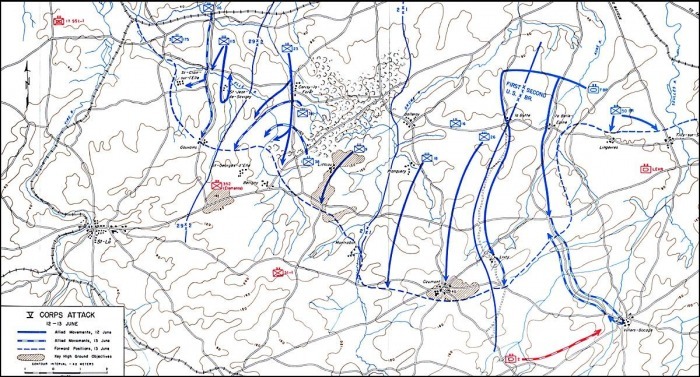 The result was an opening up of an 8 mile (13km) gap in the German line running from La Belle Epine in the north to Caumont in the south where the US 1st Division had dug in (see map on right “V Corps Attack June 12th-13th”). 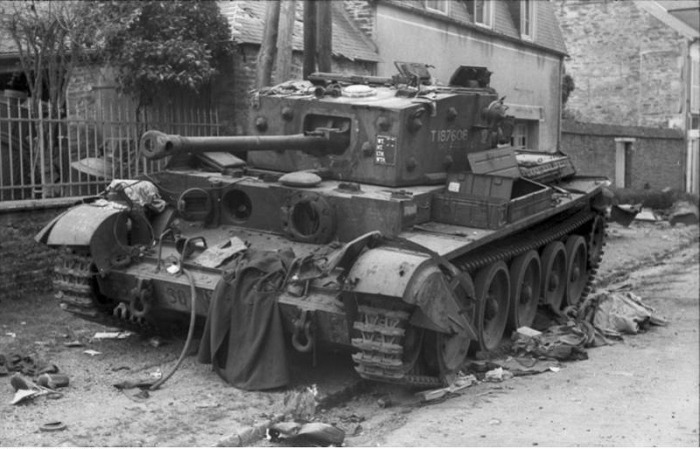 Montgommery saw this as his oppertunity to regain the initiative in his fight to capture Caen. By sending the veteran British 7th Armoured Division, the famed “Desert Rats”, through this gap in the German lines he would, in what he termed would be his 'Right Hook', encircle Caen from the south-west. 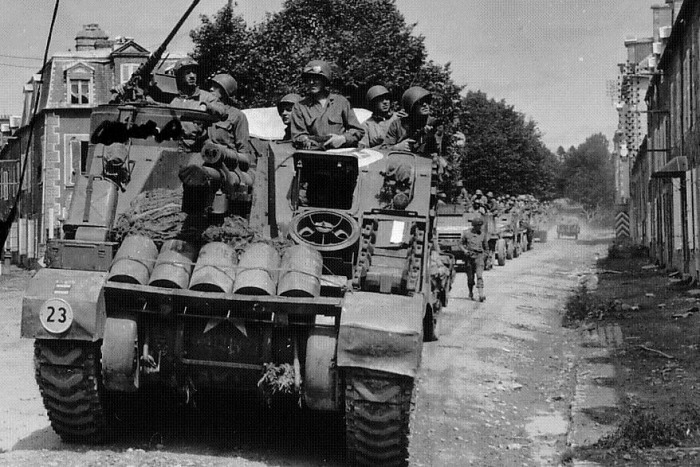 The 7th Armoured Division was immediately disengaged and started their detour but delays and other problems meant that by nightfall of June the 12th they were still behind the new American front line and only four miles (7km) from their jump-off point and still 20 miles (30km) from Caen. The following morning of June 13th, eager to make up time, the British forces left their overnight laager and pushed as rapidly as they could to the south-west to the town of Villers-Bocage, another 4 miles (7km) further distant. 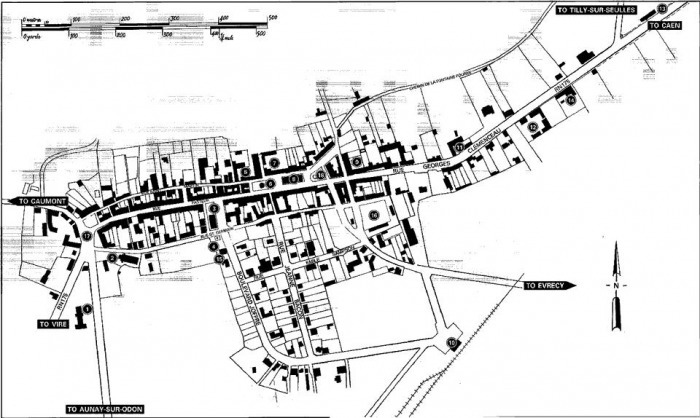 Villers-Bocage was another minor, but still important, junction town in the Norman road network and, more importantly, the dominating heights of Point 213 were just a mile (1.5km) further east of the town. At 8:30am the lead British vehicles approached the town but facing no resistance by 9:00am had passed through the town with no more bother than a few isolated snipers and had invested Pt 213 with their leading squadron of tanks. The British units following in the lead column of the 22nd Armoured Brigade were told to take a break as they waited for the rest of the Division to catch up and they relaxed their guard, secure that the point of the column was strongly held, and started to brew up their morning tea. Unbeknownst to them, the Germans were there and watching, and one was Obersturmfuhrer Michael Wittmann of the SS. In June of 1944 Wittmann was in command of a company of tanks of the 101st Heavy Tank Battalion of the 1st SS Panzer Division. Already highly experienced and decorated, Michael Wittman was credited with over 100 tank kills before he arrived in Normandy, most on the eastern front. The 101st Heavy Tank Battalion had been in Belgium on June 6th, but was one of the first tank units moved into Normandy by the direct order of Hitler. Owing to Allied air attack on the German transport system and mechanical problems with their tanks they had taken until the previous evening to arrive and only 6 Tiger tanks had got there, with the rest strung out along the road from Paris behind. 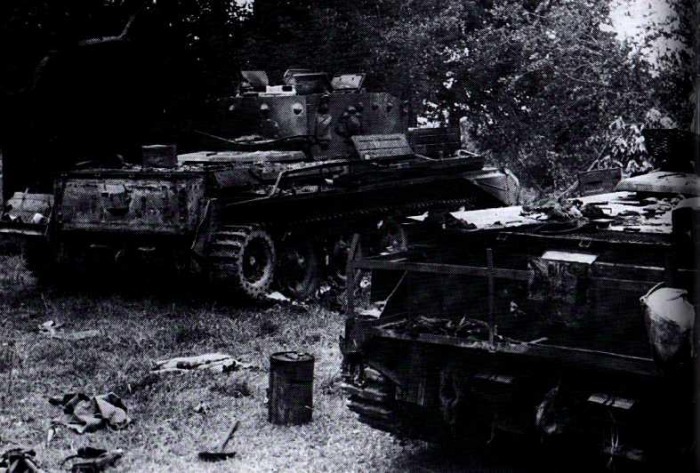 These few lead tanks had encamped at Villers-Bocage, 6 miles (10km) behind the lines held by the Panzer Lehr Division, to do maintenance on the tanks before moving into action. However, upon arriving in Villers-Bocage on June 12th Wittmann had realised the importance of holding both the road junction in the town and the high ground of Pt 213 in the event of an enemy attack and had positioned his tanks to cover any attacks on there positions. The British had now pulled up and stopped right under his nose, and they didn't even know he was there. You will be driven into the town along the route that the Spearhead Brigade of the 7th Armoured Division took on that fateful morning, shown where the lead tanks parked up to secure Pt 213 and where the remainder of the armoured column pulled up along the road stretching back through the town. You will be shown where all 6 Tiger tanks of Michael Wittmann's unit been hidden as the British moved through the town. As the attack started Wittmann sent four Tigers up to deal with the British force on Pt 213 and headed into the town himself with the other two. Wittamnn's Tiger broke down almost immediately and so, taking command of the second Tiger, he pressed ahead alone. You will see where the various British tanks were parked as Wittmann's attack started, how, with a lot of the crews outside the tanks, there was a scramble to re-man their vehicles. About one tank that managed to reverse into a side-street unseen and was in a perfect position to end Wittmann's rampage as he drove past- except for the gunner who was spending the most expensive penny of his life and was not in the tank to shoot. 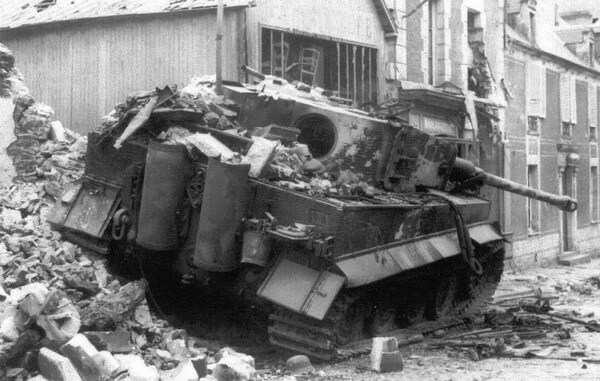 Stories of other tanks that tried and failed to get away until finally, having destroyed everthing in his path so far, Wittmann decided to halt his rampage when faced by more British tanks coming into the town from the west. After deciding that he had caused enough mayhem and it was time to pull out, Wittmann turned around and drove out along the road he had come in on. You will be shown where, as he was exiting the town, one lone anti-tank gun that he had missed on his way in was moved into position to fire. Although not strong enough to knock a Tiger out, the 6 Pounder anti-tank gun could disable a Tiger by hitting the tracks and this is what the British gunners did. Unable to move, but still in a strong position, Wittmann spent 20 minutes using his Tiger's machine guns and 88 to shoot at anything that looked like a target. The British withdrew and Wittman and his crew escaped to the north. 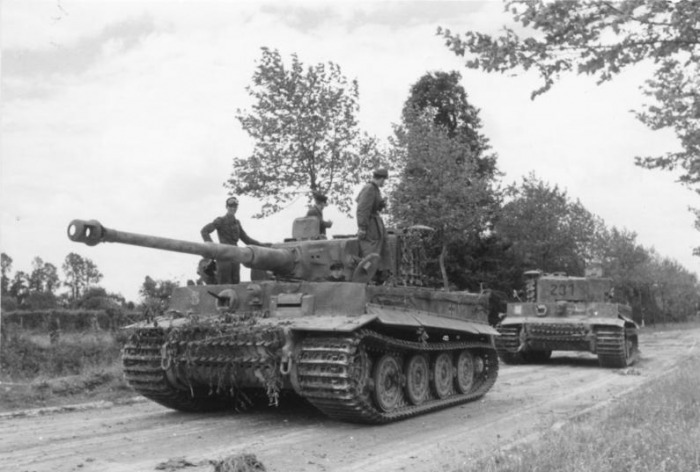 The situation was left undecided as both sides withdrew but it was the Germans who reacted faster, Wittmann returning that afternoon with 20 Panzer IV's of the Panzer Lehr Division. The issue was finally decided that evening with another SS attack using more of the Tigers of the 1st SS Panzer Division that had since arrived. By the end of his action at Villers-Bocage Michael Wittamnn had single-handedly knocked out 10 main battle tanks, 3 light tanks, 2 anti-tank guns and 13 armoured half-tracks. He was finally killed in action during the Anglo/Canadian offensive, Operation Totalize, on the 8th of August, 1944 and is buried in the Geramn cemetery at La Cambe here in Normandy.